We now have an index of artists. Pottery in North America began when indigenous tribes converted to an agrarian lifestyle, needing vessels that could hold water for irrigation and personal use throughout the day and evening (unlike woven baskets). These items were at first considered utilitarian and only later became expressions of art. Much can be learned about a culture from the type of clay used, the materials mixed in with the clay, and the decorative techniques. Some pieces were buried with the owners/makers, others used for trade and even more crushed into sherds and mixed with new pottery pieces, leaving a permanent record of our ancient relatives. Beginning in about 1880, pottery was made for sale to the tourist trade as souvenirs. Many a traveler to the Southwest would take a small piece of pottery back home in their luggage and as a result, pottery pieces were reduced in size so they were easily portable. Beginning as early as the 1960s in some areas, pottery ascended to the next level of artistic design and as recently as 1990, a return to traditional form and materials has been evident. 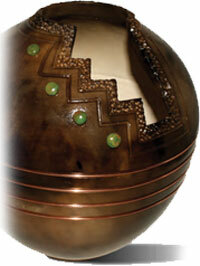 The Gerald Pinto pot illustrating this section is an updated version of traditional Navajo pottery that is embellished with copper wire and natural stone. It is indicative of the modern style many Navajo potters are moving toward. Hand-made Large Bear Ornament by Harriet Yabeny, Navajo (Diné)..
Hand-made Small Bear Ornament by Harriet Yabeny, Navajo (Diné).